With Lexus being the luxury lineup from Toyota is it really any wonder that the CT is mechanically the sibling of the ultra-popular Toyota Prius? Even though this is the case, the CT does have a personality and dynamics that are all its own once past the mechanical workings of the vehicle. With a full complement of upscale, luxury features inside and a truly menacing exterior including the signature Lexus hourglass grill, the Ct is not just a Prius in a different body, but a highly advanced luxury hybrid car that offers a ton of driving enjoyment and interest for its owners. Competing with the Audi A3 and Cadillac ELR, the CT comes in offering a great deal of excellent luxury features and equipment to enjoy and take full advantage of. Only a small amount of updates are added to the Lexus CT 200h including the integration of iPhone’s Siri Eyes Free Mode, voice commands for the navigation system, and Slacker radio to the Lexus Enform app suite. This all helps the CT attract a technology driven crowd and be one of the best entry luxury cars that also comes in the form of a hybrid vehicle. Driving the CT 200h offers an energetic and reliable drive down the road that has been a signature of both Toyota and Lexus for many years. With a highly refined suspension that keeps the car stuck like glue to the road as well as a very advanced and dynamically responsive steering system, the CT 200h is a fun ride in a small package. As with many of the F-Sport models from Lexus, the F-Sport model adds stiffer springs, dampers and anti-roll bars that help increase the overall sportiness and performance of this nicely equipped luxury hatchback. The one engine offering for the CT 200h comes in the form of a 1.8-liter inline four-cylinder engine plus an AC 650-volt permanent-magnet motor. The engine offers 98 horsepower and the electric motor comes in with 80 horsepower to give a full 134 horsepower with the two combined and 105 lb.-ft. of torque. When mated to its transmission, this engine offering comes in with a fuel efficiency of 43 city/40 hwy mpg which helps to make this car a great choice as a daily commuter or as a car for the younger professional to start enjoying their first luxury vehicle. The interior of the CT 200h is intimate and small, but offers enough leg and head room for drivers of a variety of heights to enjoy the ride. The materials used throughout the vehicle are luxury laden and upscale giving the owner a comfortable and enjoyable ride. The control clusters are infused with a ton of updated technology and adds a lot of great features and benefits to the vehicle through a variety of onboard systems that are designed to help anyone enjoy the ride. To keep with the hybrid feel and eco-friendly name plate, the leather is actually 60 percent lighter than cow hide and much of the interior trim is made from 30-percent plant-based materials. On the outside the stance of the CT 200h is one that is squat and ready to go appearing ready to take on any road and spit it back out happily. Starting the eye view in the front the hourglass shaped grill is large and functional while adorned with chrome trimming that makes its appearance in a lot of interesting and intuitive places all over the vehicle. The headlights offer a menacing look to the vehicle and the angle from the hood to the roof is enjoyable and offers a bit of added aerodynamics. The rear of the vehicle is a hatchback that offers a great deal of different cargo configurations to enjoy inside the car. The finishing touches of this great car come in the form of the double star spoked wheels that are 17-inches in size and give the car an even sportier appearance than others that aren’t quite as stylish. 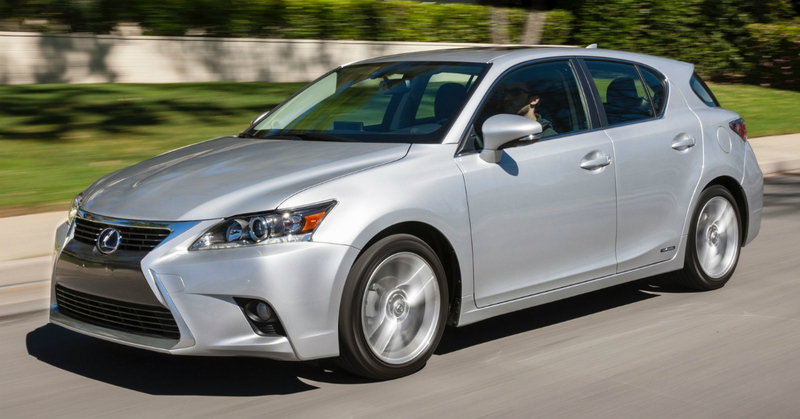 The Lexus CT 200h offers a very nice list of great luxury features for any driver to enjoy. The standard features that are offered for this car include keyless entry, dual-zone climate control, a ten-way power driver’s seat, a six-speaker audio system, a leather-wrapped steering wheel with audio controls, Bluetooth interface and SiriusXM satellite radio are all had on the base model. Upgrading to the premium model will add heated front seats, rain-sensing wipers and a moonroof to enjoy. With this great list of standard features this car offers a lot for anyone to enjoy who also feels it very important to help reduce their carbon footprint with a hybrid vehicle. The optional equipment offered for the CT 200h comes in some great packages for any shopper to choose from. The Seat Comfort package adds heated seats and a power passenger seat. The F Sport package adds a sporty suspension and many exterior enhancements that create a sporty vehicle out of a hybrid hatchback. The Navigation package adds a rearview camera, a voice command HDD tilt-screen navigation system with a remote controller, NavTraffic and several other features. The leather package adds real leather upholstery to the car along with electrochromic mirrors, a memory driver’s seat, dynamic cruise control, and a Pre-Collision System. Adding one of all of these packages will take this car to the top of the luxury segment easily in order to make sure drivers are able to enjoy a ton of great additional features and benefits. The pricing for the Lexus CT 200h starts at a base price around $33,000. Adding features, packages and loading the car full of equipment comes in just above the $40,000 price which is a great price for a car that is a luxury hybrid hatchback. Many luxury automakers shy away from offering a hatchback, not to mention one that comes as a hybrid vehicle, but Lexus wasn’t afraid to do it and this car will gain a great following and offer a choice for many to enjoy.